Like the song says, “Everything old is new again.” 2010 saw the studios doubling down on Blu-ray as the economy began to improve. With that decision, DVD collectors were faced with deciding whether films they already owned were worth the upgrade when released on Blu-ray. In many cases, a good DVD of a relatively recent movie will approximate the same quality as the newer discs because of a Blu-ray player’s “upconvert” feature. It’s often in the classic film arena, or what are referred to as catalog releases, where one sees the biggest difference. That is why many home theater aficionados gravitate to these discs. It is also why the majority of the films on my list are pre-1980 and on Blu-ray (those on Blu-ray are available on DVD as well). * Watching these on Blu-ray can often be revelatory, as I’ll point out in individual entries. But don’t worry. I also highlight a few new films from the last year. Also, all of the entries are readily available in the US. In some rare cases where films are only available on DVD, I will point that out as well. *One disclaimer: There are a multitude of DVDs and Blu-rays released every year, making it incredibly difficult to catch up with them all. This list simply reflects the best of what I caught this year (with obvious personal prejudices skewing the list even further). So if you disagree, or feel something was unjustly left out, feel free to send in some suggestions. I might want to check them out. Well, let's see how this blu-ray matches up to the spectacular print that will be offered up at Manhattan's Film Forum next month. I'll be there, and in the near future will make some kind of judgement when I acquire this welcome blu-ray release, but don't for one second doubt this rightful celebratory announcement, which finally will allow me (and many others I'm sure) to upgrade from a decent Region 2 DVD set. Which Blu-ray are you referring to? I listed close to 20 of them. The African Queen, Tony, which, you feature in the lead-in picture replication to the post. 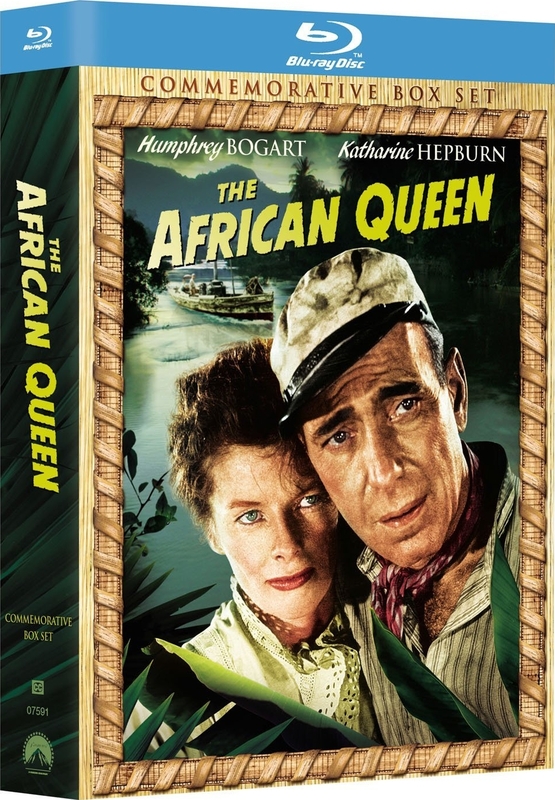 Sorry, I was confused because I listed various Blu-rays, most of them classic films, and AFRICAN QUEEN wasn't my top choice (which it seemed you were implying in your note). I just thought it had one of the more "neat-o" covers of the lot. You're a fan of In Treatment right? Season 2 recently came to DVD, and it may be even better than the first - though once again the Special Features, for some reason, are nonexistent. Craig, I do love IN TREATMENT, and am a proud owner if season 2. But I liked it a little less than seasons 1 and 3. I found most of the patients more irritating (except the girl dealing with cancer, who was both sensitively written and acted). I think I would have liked the divorcing parents a bit more interesting had they been the same characters as those played by Josh Hopkins and Embeth Davidtz ( as they were in the original Israeli show, B'TIPUL). Also, I liked the structural inventiveness of the first season, particularly with the out-of-pattern episodes dealing with the pilot's dad and Paul's family. Still, I don't mean to knock Season 2 too badly. It's great television. Season 1 definitely has the advantage of novelty. On the other hand, Season 2 has the advantage of no Melissa George. I also was sort of tired of Embeth Davidtz and Josh Charles by the end of S1 and enjoyed Sherri Saum and Russell Hornsby much more in S2. Alison Pill was the breakout star, as you indicated; just as Mia Wasikowska was in the first season. Haven't seen the third season yet, but will when it comes out on DVD (next year, undoubtedly). Ditto on Melissa George, Alison Pill, and Mia Wasikowska. Look for Irrfan Khan as the breakout performance of Season 3.